riday, President Jovenel Moïse, in the presence of Carmel André Belliard, the Minister of Agriculture, parliamentarians of the Artibonite, the departmental delegate, entrepreneurs and notables met at Pont Sondé, the owners and representatives of mills of the Artibonite. This meeting was to ascertain from the mill owners that the amount of rice production, likely to be available in the month of September, can be converted properly there. While welcoming the wishes of President Moïse, the owners and representatives of the mills reminded the Head of State of certain problems they face, particularly with regard to spare parts, marketing channels and the modernization of mills. They also wanted state supervision, shops and boutiques in favor of farmers, a rational distribution of fertilizers and the creation of a cooperative of mill owners in the department. While recalling the many works under way in the Valley, the Head of State promised the Government’s accompaniment to the mill owners of the department, encouraging farmers and planters to regroup for a better organization of their actions and better supervision of the State. He also promised, as soon as possible, credit to mill owners for the purchase of new equipment, parts and engines, and the replacement of defective mills. 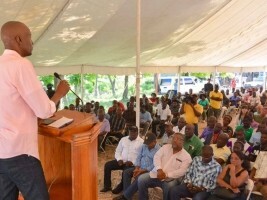 Finally, Jovenel Moïse announced to them the re-opening of the Middle School of Agriculture of the Valley of the Artibonite (EMAVA) and the creation this year of 9 rice processing plants in the Artibonite Valley.